1. Heat the chicken stock in a saucepan on low. 2. Heat 2 tbls olive oil over medium heat in a separate medium-sized pot. Add the onion and cook until it turns translucent, about 5 minutes. Add the garlic and cook 1 minute more. 3. Add the rice and turn the heat to low. Cook 2-3 mintues stiring frequently. Add about 1 cup of the hot stock to the rice mixture, and stir slowly until the stock is absorbed. 4. Continue to add the stock 1 cup at a time, stirring slowly, letting the rice absorb the stock before adding more. 5. Cook chicken in seperate pan with the remaining 2 tbls of olive oil. 6. The risotto is cooked when it is creamy on the outside and slightly firm (al dente) in the center, about 20 to 25 minutes in all. Stir in half of the Parmesan cheese, the red peppers, and the chicken.Add salt and pepper to taste. 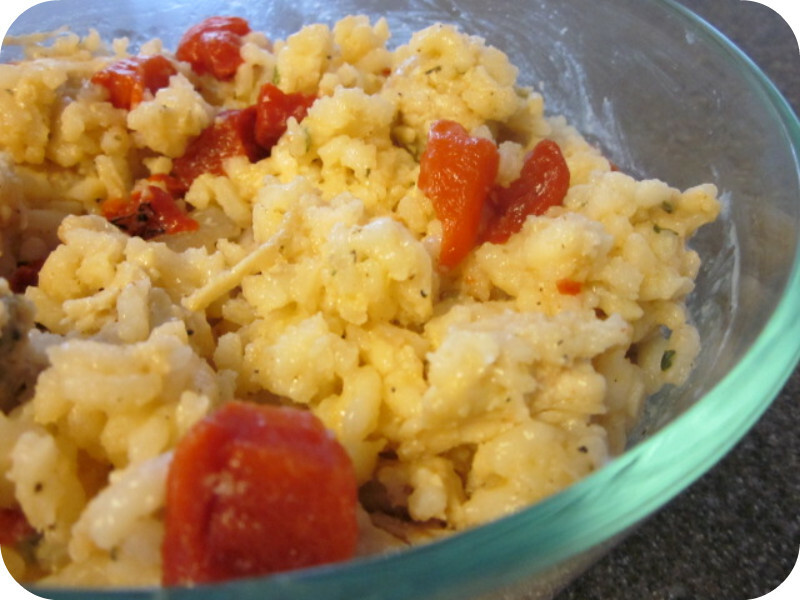 If the risotto is too thick, add a little more stock until it becomes creamy. 7. Serve the risotto sprinkled with the remaining cheese. Good for supper and great as a leftover packed lunch. My little guy is 8 months old and loves using his “pinchers” to pick up food (and everything else) he enjoyed this heated up the next day for lunch too!